Bacteriorhodopsin (bR) is a membrane protein that harvests the energy content from light to transport protons out of the cell against a transmembrane potential. Nango et al. used time-resolved serial femtosecond crystallography at an x-ray free electron laser to provide 13 structural snapshots of the conformational changes that occur in the nanoseconds to milliseconds following photoactivation. These changes begin at the active site, propagate toward the extracellular side of the protein, and mediate internal protonation exchanges that achieve proton transport. Figure. Structure and function of bacteriorhodopsin (bR). 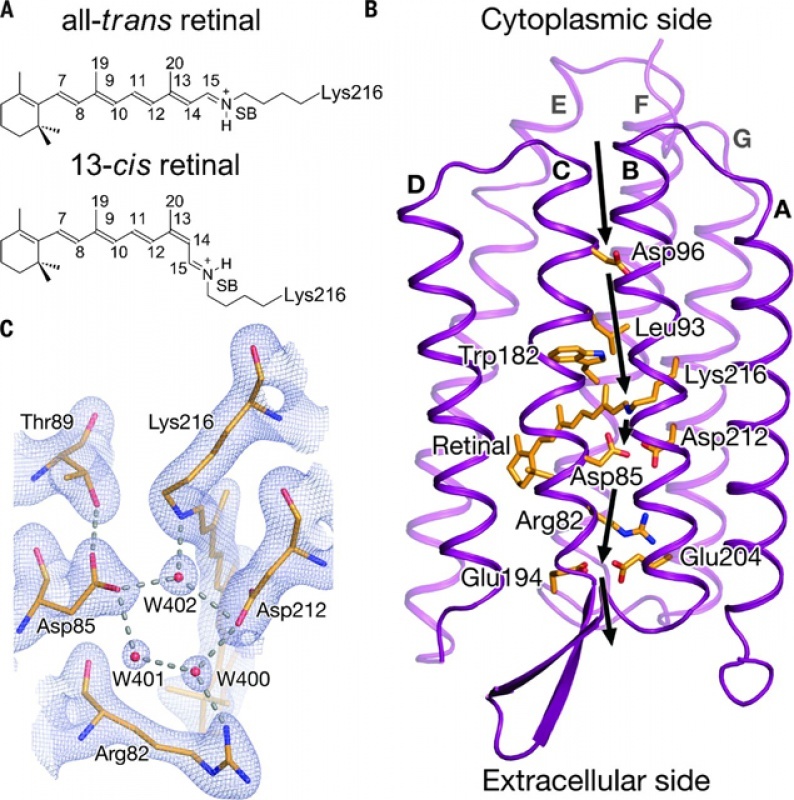 (A) Schematic illustrating retinal covalently bound to Lys216 through a protonated Schiff base (SB) in an all-trans and a 13-cis configuration. (B) Proton-exchange steps (arrows) achieving proton pumping by bR. The primary proton-transfer step is from the SB to Asp85 and corresponds to the spectroscopic L-to-M transition. (C) 2mFobs – DFcalc electron density for the bR active site in its resting conformation. Electron density (gray) is contoured at 1.3σ (σ is the root mean square electron density of the map). W400, W401, and W402 denote water molecules. Reference: Nango, E., A. Royant, M. Kubo, T. Nakane, C. Wickstrand, T. Kimura, T. Tanaka, K. Tono, C. Song, R. Tanaka, T. Arima, A. Yamashita, J. Kobayashi, T. Hosaka, E. Mizohata, P. Nogly, M. Sugahara, D. Nam, T. Nomura, T. Shimamura, D. Im, T. Fujiwara, Y. Yamanaka, B. Jeon, T. Nishizawa, K. Oda, M. Fukuda, R. Andersson, P. Båth, R. Dods, J. Davidsson, S. Matsuoka, S. Kawatake, M. Murata, O. Nureki, S. Owada, T. Kameshima, T. Hatsui, Y. Joti, G. Schertler, M. Yabashi, A.-N. Bondar, J. Standfuss, R. Neutze and S. Iwata (2016). A three-dimensional movie of structural changes in bacteriorhodopsin. Science 354: 1552 (10.1126/science.aah3497) Nango-2016 (1.52 MB).